…above that is. 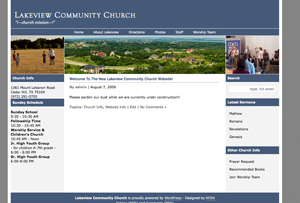 Yeah, I was asked recently to do a website make over for my local church (Lakeview Community Church). So I’ve gone out and got the church a new domain (since their old one expired) and some quality hosting (something that probably wasn’t with the old site anyways). Check out the progress at lakeview-church.org.